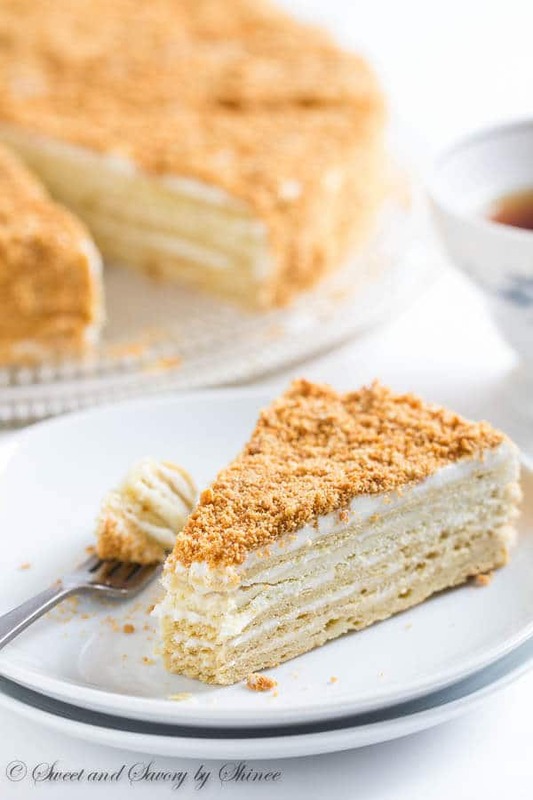 Buttery, flaky pastry layers generously filled with sweet cream filling…This Russian cake “Napoleon” is the sweetest taste from my childhood. I can’t imagine my childhood without this cake called “Napoleon”. You see, my mom is a talented baker, and I think I got the love for baking from her. Among many sweet treats, she used to bake this particular cake quite often, for us, for friends, and for coworkers. It’s her signature cake, if you will, and we absolutely loved it. One bite of this cake sends me right back to my happy childhood! I don’t bake this cake as often as I should though, but it’s definitely one of my top favorites. 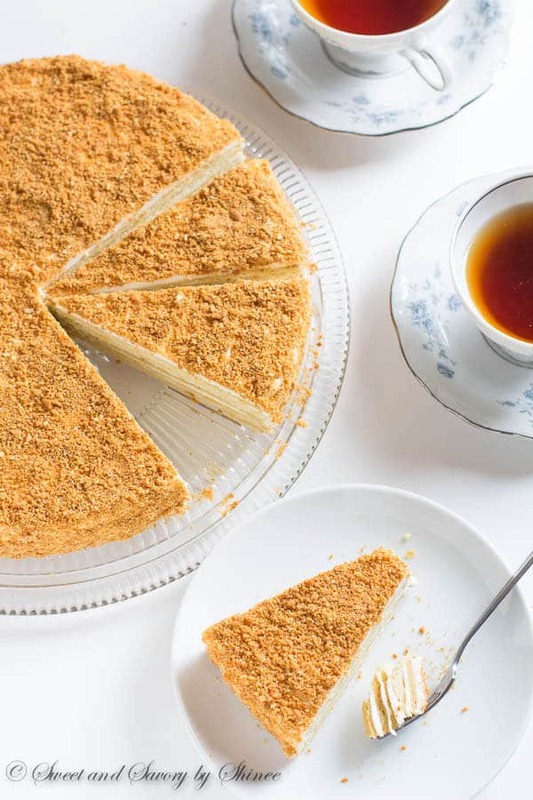 The cake consists of five flaky, buttery pastry layers with sweet buttercream filling. It’s rich, buttery and oh-so-delicious! Best paired with a cup of tea without sugar. This recipe is right from my mom’s oldest recipe notebook. You know, the old and worn-kind, filled with lots of handwritten recipes, mostly Russian sweets and treats. Her recipes are short and not as detailed, much like the one your grandma would’ve passed down. I shared this recipe back in 2013. Last month, my mom made this cake for me, when she was here to help me with my newborn. So I took the opportunity to re-shoot the photos and re-share the recipe with you again. We’ll start with making buttery, flaky pastry layers. Just like making a pie crust, we’ll incorporate cold butter into the flour and mix it with egg mixture until nice dough forms. It’s ok to have a small pea-size butter pieces here and there. It’s actually desirable for ultra-flaky layers. Resting the dough in the fridge helps us to easily roll it out into nice and thin circle. We’ll bake each layer separately in a hot oven for a few minutes. And once the pastry layers are baked and cooled, we will trim the edges to form perfect circle. Save those extra trimmings for later! Ok, this sweet cream filling is what really makes this cake. It’s buttery, smooth and fluffy. Not your regular buttercream here. The technique is rather strange, but it yields the most delicious, silky smooth filling. We’ll generously fill each layer with said filling and let it rest for at least 5 hours, or preferably overnight. That’s the thing, it requires major patience. But it’s essential to give the filling enough time to soak into the flaky pastry layers and soften them for that perfect bite. To make the pastry layers, mix together the egg, water, baking soda and salt. Blend cold butter cubes with flour. Add egg mixture and mix until well combined. Divide the dough into 5 equal pieces. Wrap each ball in a plastic wrap and refrigerate for 30-60 minutes. 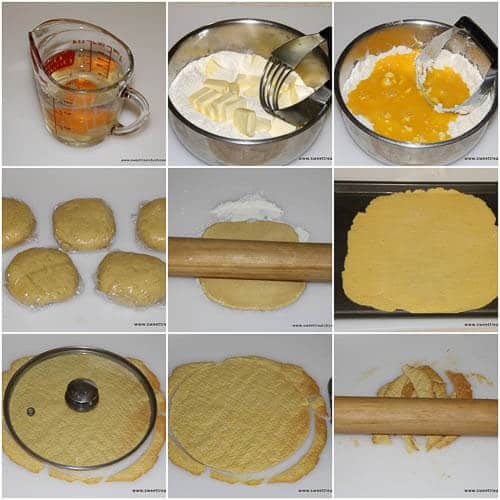 Roll each dough ball into 10-inch circle on slightly floured surface. Transfer it onto a baking sheet and pierce it with a fork everywhere. Bake each layer for 10-12 minutes, or until golden brown. 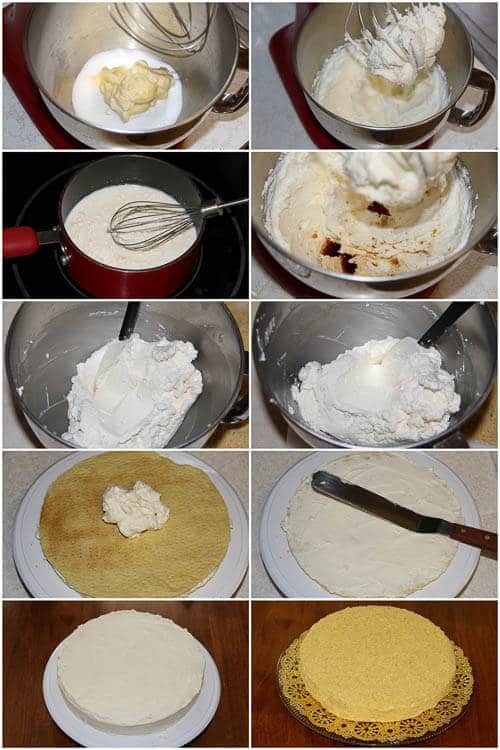 To make the filling, mix flour and milk and whisk until well combined. Bring it to boil on medium heat, stirring frequently. Once the milk mixture is thick, let it to cool completely. Beat softened butter and sugar until sugar is mostly melted. Add vanilla extract. Add cooled milk mixture and beat everything on high speed until well combined. To assemble the cake, once every layer is baked and cooled, trim each layer, using a 9-inch round plate. Save the leftover crust edges. Spread the filling between each layer and stack them up on top of each other. Then frost the entire cake with the remaining filling. Crush the saved crust edges into crumbs, using rolling pin or blender. Sprinkle the crust crumbs all over the cake. Awesome. Thank you for your feedback, Anna! Hi, all who made this cake Napoleon. I have this recipe from my mother and grandmother. I have been making Napoleon since I married over 50 years now. Those who ate it loved it and always asked for the recipe.it takes a lot of time to make it because of the layers you have to bake, but it worth it.Sometimes I make filling milk-butter-eggs (5). It feels very delicious..Unfortunately, not all English people like it, even don’t try to taste it, because of different appearance of it.All my friends love it and I indulge them on special occasions.I am happy to read comments of those who make it and love to eat it.It is great undisputedly for tea! Enjoy and present Napoleon to your relatives and friends!!! Tatiana, I so agree with you all the work is totally worth it when it comes to Napoleon. And it’s so good with tea. Thank you for your lovely comment. Leah, thank you for the great tip and for your feedback! 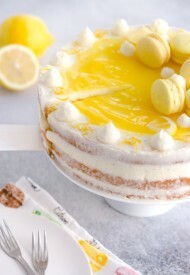 Hi SHINee, this cake looks so different from my Napoleon, mostly because of you the thick layers. 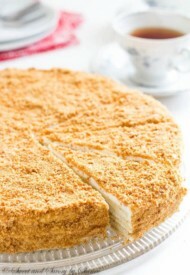 (that’s what made me click on it on Pinterest) I know you said your mom made it, but I was wondering how it tastes/feels that way..does it have the texture of a honey cake? That’s what it looks like to me. Very curious! Is it necessary to put weight on the pastry to prevent it from rising? Hi, Guy! I don’t put weight on the pastry. Just piercing with a fork does the trick for me. I made this cake for my Russian 102 class and everyone loved it, even my Russian Professor who’s from Siberia. The only thing she said was to make the layers paper thin and that if they broke in the process, that it was fine but what was most important was getting them paper thin. She also mentioned that it’s best to let the layers set with the filling overnight, then frost the rest of the cake the next day, that way the layers set instead of frosting a warped cake. Thanks again for posting your receipe, I must have gone through a ton before ultimately choosing yours. Hi, Natasha! Thank you so much for your feedback. I’m so glad you chose my recipe and that everyone loved it. And yes, I agree with your professor, some people make 7+ layers, rolling them super thin. For some reason, my mom only makes 5 layers and she insists Napoleon has 5 layers, and Medovik (similar cake, but with honey) has more layers. Haha Hope you’ll try it with more layers next time. 🙂 Thanks again for your feedback. Not good, followed exactly and the cream turned out all wrong and cake layers were too crunchy. Plus, hate all these whole reviewing and writing comments who haven’t even made it yet. Diana, you sound pretty bitter about the failed recipe, since you left pretty much the same comment again, yet not providing any helpful details as to what was wrong with the cream. I’m more than happy to help you to troubleshoot the issue. And how on earth do you know that these comments are fake and people leaving false reviews? Do YOU do that? Because I don’t understand the point of people leaving false reviews! I wouldn’t accuse people without the evidence! I try really hard not to take your comments insulting. This’s my mom’s recipe that she made 1000+ times throughout my childhood for us kids and her friends for pretty much every holiday. And I make it just fine myself. I’m all about constructive feedback where you share what went wrong and I try help you out to find the solution. But I find your comments less than helpful, more just venting. When something doesn’t turn out right for me, I don’t blame the recipe first, rather I try to figure out what I may have done wrong. But that’s just me, and you do you! Hi, Diana. Sorry to hear your trouble with my recipe. Not sure what was wrong with your filling. And I didn’t get what you mean by adding butter at the end when mixture is cooked. Do you mean butter is added while the milk mixture is cooking? OR after the milk mixture is cooked? In my case, we add the cooled milk/flour mixture into the whipped butter to complete the filling. If your milk/flour mixture was hot, it’ll melt the butter, and the filling gets soupy. Anyway, I appreciate your feedback. Holy cow is this soooo good!!! Very, very sweet, but very, very good! A Russian co-worker sent me the link to this recipe – I made some for her! I thought it would be more of a pain to make but it really wasn’t. I did cheat a little and baked 2 of the layers at the same time on different racks in the oven. Have you ever used the crust recipe for pie crust? It is the most flaky crust I’ve ever made! Excellent!! Hi, Marlene! Soo happy you tried and loved this cake!! Yes, it’s quite rich cake, but it’s just so good, right? And thank you for your feedback! I’ve never used this exact recipe for pie crust, but when I compared it to my foolproof pie crust, they’re actually pretty similar! Hope you’ll try that pie crust recipe, it’s amazing too! Thank you for the recipe. I will certainly try to make it.I grew up in Russia and the Russian Napoleon Tort (cake) was always the centerpiece of any special occasion/celebration. My mother would wake up very early to start baking, sheet by sheet. At the same time, she would be making the most amazing cream that I was allowed to taste after she was done with all preparations. The smell, the taste and the anticipation of the most delicious piece of cake is still one of the best memories of my childhood. By the way, the cake always tasted much better the next day. Hi, Marina! You basically described my childhood as well. 🙂 Except my mom used to make this cake late at night, and we, kids, went to bed looking forward to morning to have some for breakfast! And agreed, it’s always taste better the next day. Hope you will make it soon, and let me know how it turns out. Quick question, I accidentally put the milk mixture in when it was still hot and it made the mixture very liquid like, what can I do to fix it? Hi, Carina! Sorry to hear the trouble. I’d suggest to put it in the fridge to harden a bit, and then try whipping it again. Since the milk mixture was hot, it melted the butter and that’s why it god liquid. So I’m hoping cooling it in the fridge might save it. Hope it turns out. Let me know. Oh bummer, but good to know. Thanks for coming back and letting me know, Carina. Hope you enjoyed the cake despite the trouble. Wow, what an elegant dessert! Delicious! This cake is so gorgeous! Thanks for linking up with What’s Cookin’ Wednesday! This dessert looks so elegant and delicious – totally sounds like my jam! Thanks for sharing this, found you at Friday Favorites, pinning for later! Thank you, Katie, for stopping by! This is gorgeous and pure! No-nonsense in this recipe- I love it and I will defintiely try it- sounds like I’ll need to do it while the kids are somewhere else though! This looks like a lot of work, but I think it would be fun to try. It looks amazing, and I love things that hearken back to my Russian heritage. Thanks! Meg, you’re right. It takes a bit of effort, rolling and baking each layer! But it’s totally worth it. I have never heard of this cake but it looks and sounds divine. 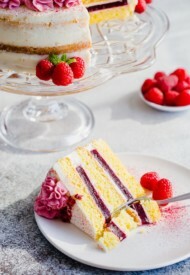 I hope I don’t offend the tradition of this cake, but I was wondering if it has ever been tried with adding a raspberry or other fruit purée to the cream or with an extra layer of a fruit purée, and what the fruit would to do the consistency of the cake. Hello, I have a Lithuanian Bakery in my town. They make a Napoleon torte that is virtually the same only it has a layer in the middle with Apricot preserves. It’s my favorite birthday cake. VERY delicious. So yes you can add fruit. Wow, this looks amazing. I’m going to have to work up the ambition to try this. It’s so worth it, Shannon. Hope you give it a try. Thanks for stopping by! 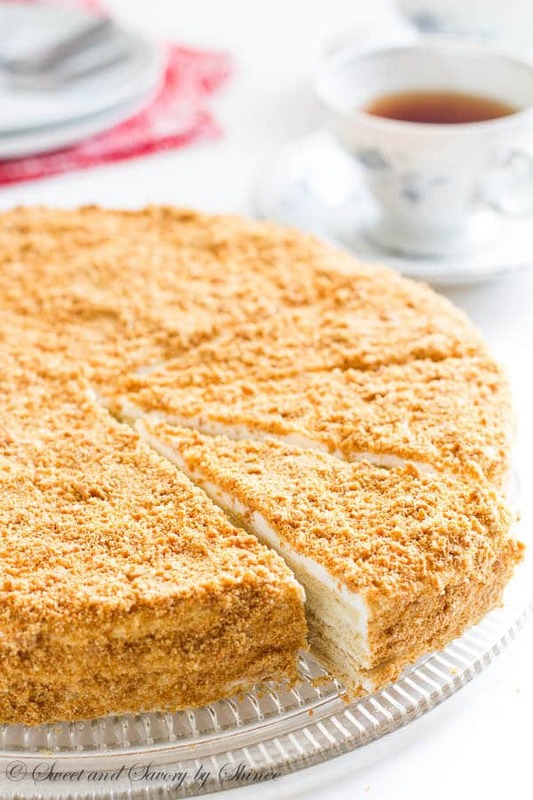 My russian grandmother makes the best napoleon cake too, and she also makes an incredibly delicious white chocolate mikado which is pretty similar to this. I wish I had a slice right now, thanks for the nostalgia! Agreed, this cake brings nostalgia like none other! I bet your grandmother’s was amazing!! This cake looks absolutely good!! ohhh so delish! so light! this Russian cake Napoleon is mouthwatering! I will have to try this soon! Thanks for the recipe! Why doesn’t it surprise me, whenever I see a delicious recipe in the link-up, it is yours. This looks so beautiful and delicious. Aww, you’re too sweet, Celeste! Thank you! Wow, what an elegant dessert! Love all those stunning pastry layers 🙂 Delicious! Those layers are simply yum! Thanks, Medha! Oh Gosh, I remeber I found the pretty same recipe of this cake on my fathers 20+ year old notebook 🙂 Definitely the best recipe of the best cake! Yep, the best cake from childhood! Thank you, Od! Hmm, yagaad shingen bolood bgaa yum boloo? Suu, guril 2oo butsalgaad nileen utguruulsen biz dee? Mun mikserdsen maslondaa hiiheesee umnu utgursun suugee sain hurguj bgaad hiisen biz dee? Haluunaar ni hiisen bol maslo chini hailaad shingersen yum bolov uu? Vvнийг хийж vзнээ.таны блог их гоё юм аа. баярлалаа.